"The procedure was successful and there were no complications," the White House said. First lady Melania Trump underwent treatment for a "benign kidney condition" Monday morning and will be hospitalized for several days, the White House said. Mrs. Trump, 48, was admitted to Walter Reed National Military Medical Center in Bethesda, Maryland, for an embolization procedure, according to a statement from her office. She is expected to remain in the hospital for the rest of the week. "The procedure was successful and there were no complications," the statement said. "The first lady looks forward to a full recovery so she can continue her work on behalf of children everywhere." 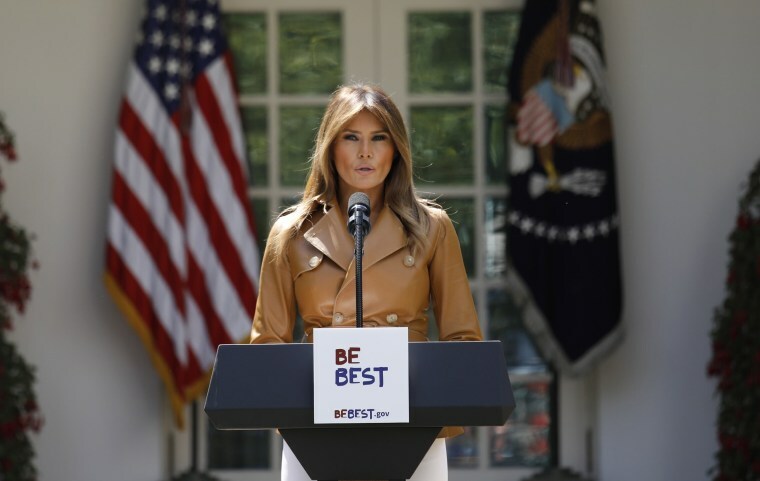 Mrs. Trump made a public appearance last week when she launched the "Be Best" initiative, her official platform geared toward issues affecting children, such as the opioid crisis and cyberbullying. President Donald Trump, who visited her at Walter Reed Monday evening, tweeted that the first lady "is in good spirits" and thanked well-wishers. Sen. Chuck Schumer, D-N.Y., who has had sharp differences with the president, was among those wishing the first lady a "speedy recovery." Just heard news that @FLOTUS underwent surgery today. Sincere wishes for her speedy recovery. Embolization procedures are used to avoid surgery. They are a way to block a blood vessel to prevent bleeding or to block blood flow to a tumor. They might be used to stop blood flow if an aneurysm — a weakness in a blood vessel wall — threatens to burst. The White House did not say why Mrs. Trump had the procedure other than to say it was a benign condition, which could be interpreted to mean it does not involve cancer. But the kidney is a complex organ and an embolization might be used to treat any number of conditions, from a growth to bleeding. Although more frequently used to control symptoms for someone who cannot undergo surgery, surgeons often use this technique to make it easier for a surgeon to remove tumors and cysts. The White House gave no detail on how the procedure was done. Often, a special gelatin sponge or other material is injected through a flexible tube to clog the blood vessel. It's a common procedure, often done on an outpatient basis with the patient perhaps staying overnight. "In a typical situation, if embolization is not being done for a bleed, it would be overnight or same-day stay, but if someone had a bleed and that’s why they are having embolization, you might want to keep them longer," said Dr. Ketan Badani, director of the Mount Sinai Health System's Comprehensive Kidney Cancer Program in New York. The White House did not say why the first lady was likely to remain hospitalized for the rest of the week. Vice President Mike Pence told reporters Monday night that the medical procedure was "long-planned" during a speech in Washington celebrating Israeli independence, according to The Associated Press. Stephanie Grisham, the first lady's spokeswoman, told NBC News on Tuesday that Mrs. Trump was resting and doing well. She declined to address the vice president's comment.